On April 11, 2018, Buffalo Trace Distillery filled its seven millionth barrel since Prohibition. While that’s certainly a big milestone, the distillery isn’t resting on its laurels. Business is definitely booming, and sales are expected to go up. Distillery president and CEO Mark Brown told us Buffalo Trace has made whiskey projections through 2047. A few spirits writers were invited to partake in the celebration and were given a sneak peak at current expansions. We began the trip with a commemoration of Warehouse AA (yes, that’s its actual name), the first rickhouse built on the distillery’s new farm. This 68,800 barrel capacity warehouse is already almost full. In fact, the photo below was taken from one of the top floors. You can see the barrels on the floor below. The second warehouse, BB, is almost complete while the third, Warehouse CC, was in early stages of construction. Brown told us that 30 warehouses total are to be constructed on the new land over the next decade. The new warehouses have temperature and humidity monitoring, which allows the distillery to fingerprint what each barrel is exposed to. They are also heated with warm water-filled pipes. While the group tasted some experimental whiskies, including a bourbon matured in Mongolian Oak, we talked more about the distillery’s expansion. Buffalo Trace currently has a capacity of roughly 220,000 barrels a year, according to Master Distiller Harlen Wheatley. The expansion process is obviously multi-tiered. First, new gas boilers and cookers are to be installed. The bottling operation is moving to another part of the distillery, leaving room to add four fermenters, which will raise their capacity to about 240,000 barrels per year. In addition, a duplicate still will be added. By the way, I believe Buffalo Trace’s beer still is currently the largest in the industry at 84 inches. At that point, with 12 fermenters in place, their barrel capacity moves up to 440,000. They’re not done yet. Adding an additional eight fermenters will move the needle further to around the 550,000 number. And this is all expected to be completed by 2022. It was eye-opening to actually see the entire operation in person. I know Buffalo Trace is cranking out a lot of whiskey, but DAMN…this distillery is really cranking out a lot of whiskey! We also walked around what is to very soon become the sensory lab and company archives. All very cool. Needless to say, the bottle archive room (pictured above) left me in awe. One of the biggest surprises of the trip involves Sazerac’s partnership with The Last Drop Distillers, a company specializing in rare, ultra-aged spirits. Inside a warehouse at Buffalo Trace is the new cold storage Warehouse P. This room is kept at a constant 45 degrees and has a capacity of 400 barrels. The aim here is to slow down the maturation process, allowing barrels to potentially reach the ripe old age of 50 years while reducing angel’s share and still remaining palatable and not over oaked. The barrel pictured below was originally filled on 4/22/1993, then topped off on 1/21/2013 with a barrel that shared the original’s fill date. New barrels containing different types of whiskey are also being stored in this room. Equally impressive are all the experiments going on. Look at Warehouse X for example. They are currently studying how temperature affects maturation. We not only got to look around at all five chambers of that warehouse, we got to taste whiskey from each. Another tasting was stuff they’ve been tinkering with, including a 13-year-old wheat whiskey, an 11-year-old bourbon featuring amaranth in its mashbill, and the upcoming “Craft Your Own Perfect Bourbon” release (we tasted at cask strength, and it was delicious). There were also bourbons aged in different oaks, including Canadian, French, and the aforementioned Mongolian oak. Remember, bourbon can be matured in any new, charred oak container – the rules don’t specifically say American white oak. I’m sure they have a million other experiments they’re keeping under wraps. The day ended with the ceremonial rolling of the seven millionth barrel into Warehouse V by beloved third-generation distillery employee Freddie Johnson, with a little help from his grandson. Freddie and his late father Jimmy rolled the six millionth barrel into the warehouse a decade ago. A crowd of employees and special guests attended the festivities. I gotta say – it was a real treat to watch this. So what’s to become of barrel number 6,000,000? The distillery plans to bottle it for charity. Details to follow. Warning: whiskey geek moment. Eagle-eyed readers may see a familiar name at the center of the barrel. Yep… that would be my mark. Everyone present at the commemoration of Warehouse AA also signed a barrel. Here’s hoping I can get my hands on a bottle from both barrels. Needless to say, the entire experience was amazing. Many thanks to Buffalo Trace for inviting me along to celebrate. Here’s to the next millionth barrel, which will be here much sooner than later. Buffalo Trace paid for the entire trip. All thoughts and opinions are my own. Passing along some interesting news from Buffalo Trace. They’ve launched a new interactive website that lets you “craft” your perfect bourbon. It gives you some nice visual insight into better understanding the distilling and aging process. Once you have your “perfect” bourbon, the website will match it with the closest-in-flavor profile bourbon Buffalo Trace produces. Read the full press release below. Franklin Co, Frankfort, Ky. (Oct. 28, 2015) – There’s no denying that bourbon has become more popular these days, but many drinkers are new to the brown spirit and confused about how bourbon whiskey is made and the subtle nuances of recipes, aging, proof and warehousing. Buffalo Trace Distillery aims to change that with a new interactive website, http://www.yourperfectbourbon.com. In just three minutes, users can design a bourbon perfect for their own taste. Once online, visitors will select their own bourbon recipe and learn how the grains such as corn, wheat, rye and barley influence the taste. Adding more rye results in a more “daringly spicy” bourbon, for example. Visitors will then see animated graphics explaining how the distillation process works, before witnessing just what 55 seconds of charring can do to an oak barrel. Then users on this bourbon journey get to select which level in the aging warehouse they want their barrel to age, and learn how different elevations within a warehouse ultimately impact the taste of each bourbon. Aging and proof round out the end of the experience, before each custom designed bourbon is complete. Then a description of each participant’s perfect bourbon is unveiled, based on their individual preferences. While each custom designed bourbon is unique, the website will also identify actual brands from the Buffalo Trace portfolio that taste most similar in profile, helping fans learn what they might like the next time they crave a sip of bourbon whiskey. *Please note, this website (www.yourperfectbourbon.com) is for entertainment purposes only, not for the purchase of whiskey. 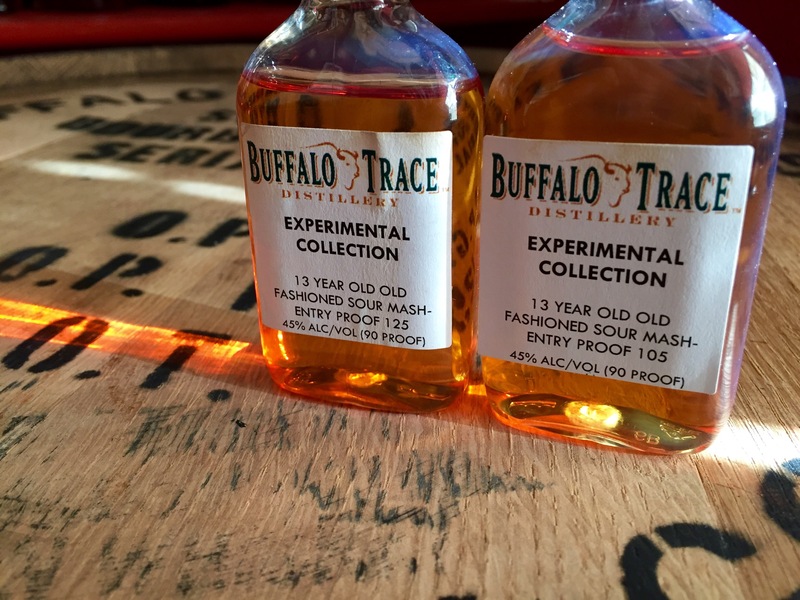 The latest Experimental Collection release from Buffalo Trace Distillery involves the sour mash process. Just about all bourbon is made using sour mash. Basically, once the mash is cooked, some setback (previously distilled mash) is quickly added to “sour” the mash before yeast is added for fermentation. It helps control PH levels during fermentation, which affects the final flavor of the whiskey. It also helps achieve consistency between batches. These particular whiskies were distilled in 2002 and entered barrels at two different entry proofs – 105 and 125. They were aged for 13 years on the seventh floor of Warehouse I. Barrel entry proof also affects how the final bourbon turns out. The lighter nose of the two, the 105 Entry proof carries a large vanilla note. I also get light caramel and cherries. All the aromas here seem to be separated and easily picked out. The official tasting notes mention vanilla and fruit for the palate. That fruit to me is cherry. Those two notes really dominate the palate. There’s a hint of oak and little brown sugar. The finish turns a bit dry. The nose here is a bit more traditional – caramel, vanilla, spice, and oak. A caramelized cherry note is also present. The aromas here seem more compact or concentrated compared to the 105 Entry Proof expression. There is a bit more body here, maybe even oilier. Oak spiciness shines here, along with fruit and light burnt sugar. The finish isn’t as dry as in the 105, and comes across as sweet. Buffalo Trace Experimental Collection releases are always interesting, and this Sour Mash experiment is no different. The fun comes in comparing and contrasting the two sibling releases. Both are superb whiskies, and I recommend picking both up to experience how different entry proofs will yield different whiskies.